…..and the sky is grey…. Sometimes, and only sometimes, an overcast grey sky is better than clear and blue. Had it been the latter on the day I took this photo, then the reflection on the open window may have been too blue and not provided the contrast I needed between the surrounding blue which was a result of the reflective colour used in the glass. 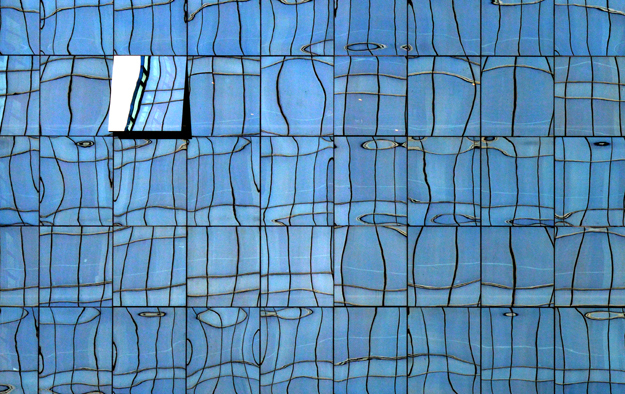 This entry was posted in abstract, Art, Digital Art, photography and tagged abstritecture, blue, glass, reflection, window. Bookmark the permalink. Nice shot! I like the interruption in the pattern. Oh my! That’s SO good.